Everyone has heard me going on and on about Ulta3 polishes, one of my favourite Aussie polish brands. So, in celebration of all my awesome followers, and that I have launched my Ulta3 colour guide, I thought it was time for a giveaway. YAY! I'm going to give away four prizes, because I want to share the love as far as my pocket will allow. First name drawn will get 10 brand new Ulta3 polishes. Spring shower, hollywood, sweet violet, snazzle, antique copper, envy, precious, lollypop lilac, bo peep and fruit tingle. Check out swatches on my Ulta3 colour guide. Second name drawn will get three brand new Ulta3 polishes - and they are awesome metallic ones that I love. Snazzle, precious and lolypop lilac. Third name drawn will get two brand new popular shades of Ulta3 polish. Fourth name drawn will get a brand new bottle of one of my custom Ulta3 frankenpolishes Violet. 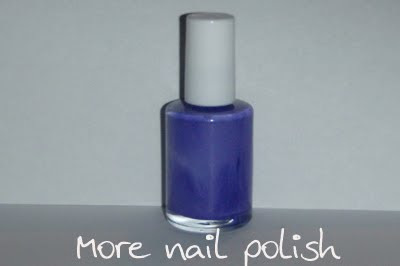 A swatch of violet can be seen here. 2. You must post a comment as your entry. just let me know in the comments. I will post the winners names here, and the winners must contact me within one week so I can arrange to send the polishes. If the winner doesn't contact me in a week, I'll redraw. Entries open for 10 days only. Ends 5.00pm Australian Eastern Standard Time - Wednesday 5 May 2010. I'm a follower, please enter me! I posted your giveaway in my sidebar and you're on my blogroll. Hehe I own all these colours - so don't enter me, but I'm going to post on it anyway. I love your ulta3 nail guide it's soooo helpful especially because there's a serious lack of polish blogs that have swatches of them! Is it okay if I''m kind of aiming for the last prize? I'm a follower, and yes, you're in my blog roll. We don't have Ulta3 here... by the way, is this international? Enter me, I'm a follower. eek! Hope I win ;) If not great giveaway! I have added you to my blog roll. I have posted a blog about your give away. You are in my blogroll and I put your giveaway on to my sidebar! Cool giveaway. Please enter me. I'm a follower and you're on my blogroll. And you're on my blogroll! Hi! Great giveaway! I follow your blog via Google Friend Connect (nastjanastja). thanks for the giveaway, I followed you! I'm a follower, enter me please! Hi! I'm a follower on Google Friend Connect. Please enter me in your contest! New follower! What an awesome comp! Thanks! Thanks for the great Ulta3 guide! i follow u thru google connect :) pl enter me in..
please enter me for your giveaway !!! love your blog. great to see more aussie nail bloggers!